I am not much of a solid, bar soap lover. The ones that I have tried give me an uncomfortable dry, tight feeling. Definitely not a fan. I much prefer the moisture-inducing properties of creamy body washes. 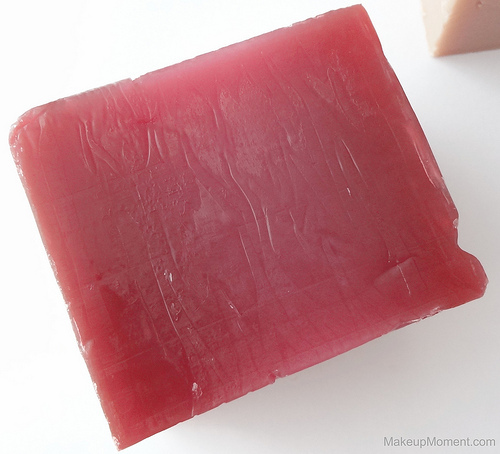 Since I was first introduced to body washes years ago, I haven't looked back at solid soap bars. That is, until I decided to purchase a few LUSH ones on a whim to try out, while browsing the LUSH website a few weeks ago. 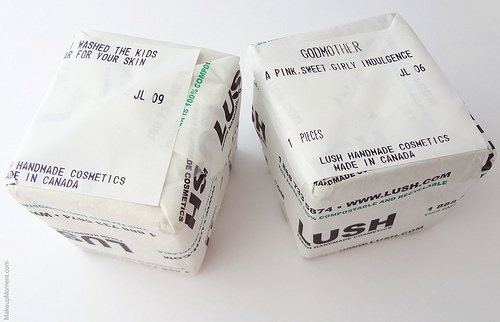 The two soaps that I picked up were, Honey I Washed The Kids ($7.95) and The Godmother ($5.95). Honey I Washed The Kids: It's inevitable to not think of a honeycomb when you look at this bar of soap. So fun, and it really adds quite a personality. 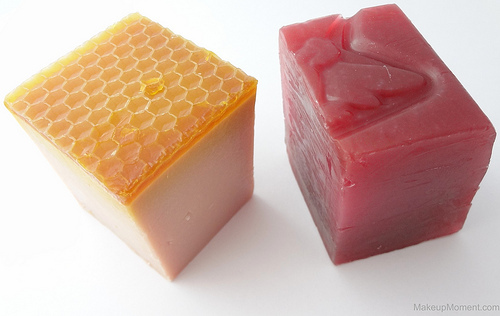 It should come to no surprise that this soap contains a lovely, honey caramel scent. So yummy! In the shower, honey I washed the kids creates a nice lather on my body, and it rinses away clean with no residue left over. Once I towel dry, my skin feels exceptionally smooth and silky. Not dry or tight at all. 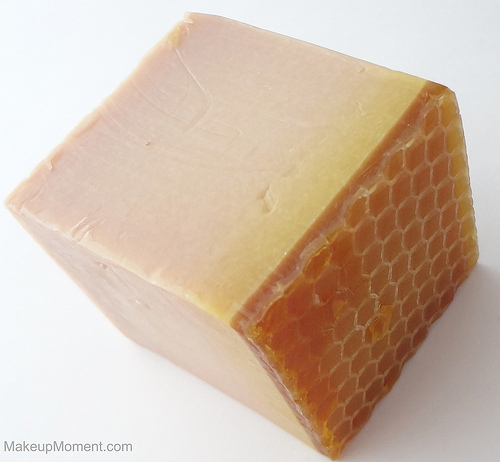 Also, I love the hint of the soothing honey caramel fragrance this soap leaves behind on my skin. The Godmother: This one sure gives me a great shower experience. The sweet aroma of bubblegum, just fills my bathroom. So pleasant and addicting. Love it! The godmother didn't induce too much of a lather and like honey I washed the kids, it rinsed away clean with no reside left behind. After use, my skin feels smooth and super clean-but not to the point where I feel stripped of. It's more of a comfortable clean. The bubblegum fragrance is very strong and prominent so, it does linger on my skin for a good while. I don't use the whole chunk of soaps all at once. What I do is, I cut each of the soaps into three pieces. That way, I will get more use out of them. These soaps aren't the most expensive, but I do want to get my money's worth and have these last as long as they possibly can. Overall, I am very pleased with both soaps and I will definitely repurchase. My favorite of the two would have to be honey I washed the kids. 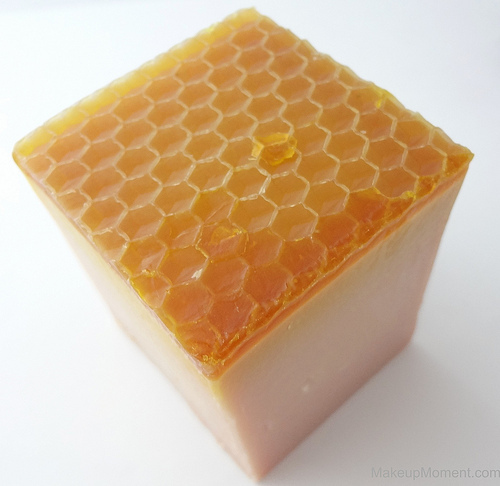 It's super moisturizing and the honey fragrance is just amazing. I can't get enough of it. 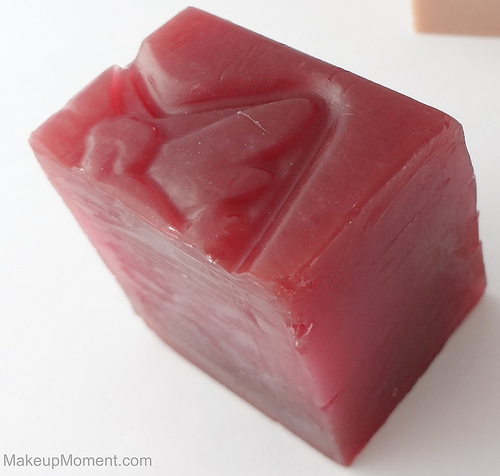 It's nice to know there are soap bars out there, that contain ingredients that will help soften the skin, and not strip it of essential moisture. If I am ever in a bar soap kind of mood, I am pretty sure I can count on LUSH to not disappoint. I can't wait to try other Lush soaps. I have my eye on rock star and miranda, next! What do you all think of LUSH's soaps? Which are your favorites? YAY, Elizabeth! I am so happy that you are a fan of Honey I Washed The Kids, as well :) I may have to look into the body butters. They sound nice! Godmother sounds amazing! I may have to pop by Lush soon & try it out! Great review!